If he is going outside his litter box, there definitely is a reason. If your cat is urinating outside his litter box, there is a reason. Unfortunately, kitty cannot tell you what it is, so it takes some effort on your part to figure it out. If your cat is urinating outside his litter box, take him to your veterinarian immediately. Some cats urinate outside their litter boxes as a way of marking territory. It is their instinctive way of identifying a space or object as theirs to other cats. This is common among unneutered males and unspayed females. However, neutered and spayed cats sometimes do it also. This can be a response to changes in their social order, such as the introduction of a new cat or other pet, or perhaps even a human. It even can be brought on by a change in their routine or a move to a new place. Cats are creatures of habit, and changes that humans deal with easily can be difficult adjustments to them. Some cats urinate outside their litter boxes when they develop a urinary tract problem. These include urinary tract infection (UTI), kidney stones and feline interstitial cystitis. All of these conditions are painful. 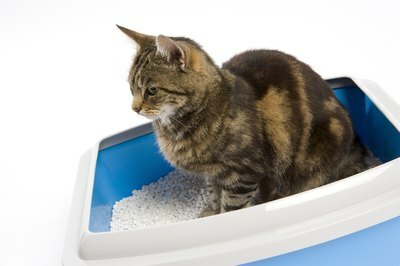 Your kitty may be associating the pain he experiences when urinating with the litter box. This is known as a negative association. This, in turn, can cause him to avoid it, which is called aversion. Some cats also urinate outside the litter box if it is not clean enough, or not cleaned often enough. Cats' sense of smell is far keener than that of humans, so if the litter box smells bad to you, it smells even worse to your kitty. Using a dirty litter box to him is like using a dirty portable toilet to you. Sometimes the reason cats urinate outside the litter box has something to do with the litter box itself. It could be hard for kitty to get to in its location. If your cat is large, his litter box could be too small for him. If the litter box has a hood or liner, it might be uncomfortable to him. The level of litter in the box also could be too deep. According to the ASPCA, cats tend to like 1 to 2 inches of litter.